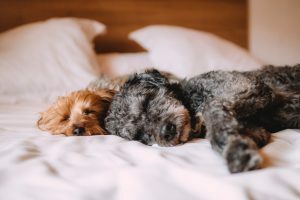 If you are in the early stages of planning to bring a puppy home, or even if you are already a seasoned dog owner, you may have heard of invisible, electric dog fences. These kinds of fences have, in the past, received a bad rap because people incorrectly assume the systems “shock” their dogs and are extremely expensive. This could not be further from the truth, though, and underground fencing systems are growing in popularity due to their countless benefits including convenience, ease of installation/removal and cost efficiency. Here at Freedom Dog Fence, we understand that your pets are your family. And when you enlist our professional services, your pets become our family, too! We are a family-owned and operated business that creates customized underground fencing solutions tailored specifically to your home and your pet’s needs. To learn more about the benefits of using an invisible fence versus conventional fencing in your yard, continue reading below and get in contact with our team when you are ready to have you system installed! An underground dog fence is, by far, a much more cost efficient alternative to standard fencing like wood, chain-link and concrete. Not only will an invisible fence be much less expensive to install, you will also be able to avoid additional costs that come with other fencing solutions like refinishing, repainting, replacement and more. In this sense, you will not only save money up front, you will also save money for years to come as the only modification you will need to make in the future is changing the battery. The high-quality systems we offer at Freedom Dog Fence monitor the status of your battery every two hours to ensure you know exactly when you need to change it. Other systems indicate when the battery drops below a specific output level, meaning they can potentially signal a false “low battery” indication—this flaw would cause customers to change batteries frequently and without guarantee that their battery was, in fact, in need of replacement. Our systems require three consecutive “low battery” triggers to activate the “low battery” indicator, saving you time and money! Just as having an underground dog fence installed will save you money on things like replacing and refinishing conventional fencing, it will also save you lots of time that you, yourself, may have to spend performing tedious maintenance tasks. Other fencing solutions like chain-link, wood and concrete require constant care and attention because everything from the weather to the quality of materials used affects the fence’s constitution. Imagine a terrible thunderstorm with torrential winds rolling through Raleigh. How is the fencing in your yard going to withstand the blow? A chain-link or wood fence may be totally destroyed, while an invisible fencing solution would remain buried underground, safe and out of the elements. Even if the fences around your home and in your yard are well built and durable, they still cannot go without maintenance forever. Wood planks will eventually need replacing or restaining, while a concrete fence may experience frequent chips and cracks. With an underground fence, the only time you will need to invest in any type of maintenance is the few minutes it will take you to replace your system’s battery! A bulky wooden or chain-link fence takes up a lot of space, especially if you already have a smaller yard. Installing a standard, above ground fence could mean the difference between a big, beautiful vegetable garden and a small, less spacious flower bed. An underground fencing solution gives you the option to install your fence wherever you would like, leaving more open space for you to decorate and landscape your yard exactly the way you would like. If that northwest corner in your backyard is the perfect spot for your sunset-watching chair but your view is impaired by a giant concrete fence, knock the beast down and call our team to have your invisible fence installed today! Never again will you miss a gorgeous sunset from the comfort of your now-open and ultra spacious backyard. Because invisible fencing systems use radio waves rather than physical barriers, you can easily install the fence anywhere you want. 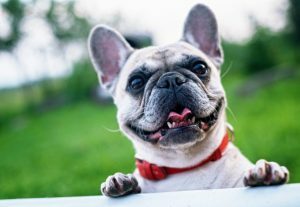 For example, if you have a front porch that you don’t want your dog to leave, you can install an underground fence around the perimeter of the porch. This way, you can enjoy a rich mug of hot chocolate on your front porch with your pup by your side and without the fear that he will run off as soon as his doggy heart desires. Or, if you have an extensive and extremely-well organized garden, you can have your invisible fence installed around your garden, preventing your dog from digging up your plants in the name of stashing yet another bone. 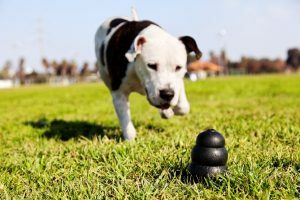 Many times, people with larger yards will actually create a miniature “lawn within a lawn,” giving their dog the freedom to explore an established area of the yard. The amount of flexibility that you are allowed with an underground fence is usually one of the biggest benefits for people who invest in them—at least that’s what our happy and satisfied customers say! Some backyards are perfectly rectangular, making it easy to install standard fencing solutions. Many yards, though, are not so simple to maneuver because of trees, bushes, sharp corners, neighbor’s yards, etc. Whatever your arrangement may be, an underground fencing system is the perfect solution. You can have it installed anywhere and in whatever “shape” best fits your yard. If your backyard sits against a breathtaking, lush grassland or faces a gorgeous lake surrounded by willow trees, you should be able to conveniently enjoy the scenery! A traditional, clunky fence will always stand in the way of your view, but with an invisible fence, you will be able to enjoy the beauty around you without worrying about your dog’s safety. An underground fence will give everyone in your family (yes, including your pup!) the freedom to enjoy their surroundings without feeling confined by an intrusive and obnoxious traditional fence. Your dog(s) will be safe, and you, your friends and your family will be able to enjoy a lovely Sunday brunch in the yard with the most beautiful nature backdrop. And don’t forget that should you ever move out of your home, your underground fence can be removed with ease, then transferred and re-installed at your new home! When it comes to your dog’s safety, an invisible fence system is, hands down, your best option. Other fencing solutions age over time and develop weak spots that can be penetrated by your clever pup. Some dogs are skilled enough to jump over fences, dig underneath them and with enough time, even bite through them. With an underground fence, you can rest assured that your dog will never be able to find its own way out of your yard. The signal wire is buried deep enough that your pup will not be able to dig underneath it, and when wearing its dog fence collar, there are no danger zones to wiggle through or fence tops to leap for. The entire perimeter of your yard will be safe and secure. Not only will an underground dog fence provide your dog the freedom to roam and explore an area without a physical barrier, it will also give you the freedom to fully enjoy your yard and neighborhood without having to peek over a giant bulky fence. Whether your yard is heavily wooded, situated on a plot with lots of hills or extremely rocky, installing an invisible fence is the perfect and most practical solution. Don’t stress yourself trying to figure out how a traditional fence could possibly fit in your yard, save yourself the money and headache and invest in an underground fencing system. The freedom you and your pup deserve is just a phone call away. At Freedom Dog Fence, we are proud to offer the highest quality underground dog fences in Raleigh, Greensboro and surrounding areas. Give us a call to schedule your free quote. We will visit your house and assess the yard, ensuring you receive the perfect fencing solution for your home. 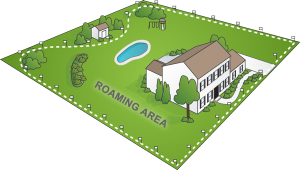 Our invisible fencing solutions are buried underground, and after a quick training period, your pup will be able to maneuver her roaming area with ease. The Perimeter® fences we install use a veterinarian-approved combination of animal training and state of the art electronics to safely train your dog. For more information or to receive your free quote, get in contact with the Freedom Dog Fence team today!